Disgraced Senator Leila De Lima keeps disgracing herself and her office. DETAINED Senator Leila De Lima admitted Monday that she did not sign the petition she had filed with the Supreme Court (SC) before notary public Maria Cecile Tresvalles-Cabalo last February 24, contrary to her earlier claim. "Due to the fact of the conditions of incarceration that petitioner was suffering on that day, the act of signing was not done face to face with notary," the senator's lawyers said in a memorandum submitted to the SC. "But the signature was presented to her immediately after the act of signing, with the notary having knowledge that petitioner was signing the petition. Despite these uncertainties, the notary public still took the additional step to verify the signature of the petitioner by asking for her proof of identification from her staffers," it added. 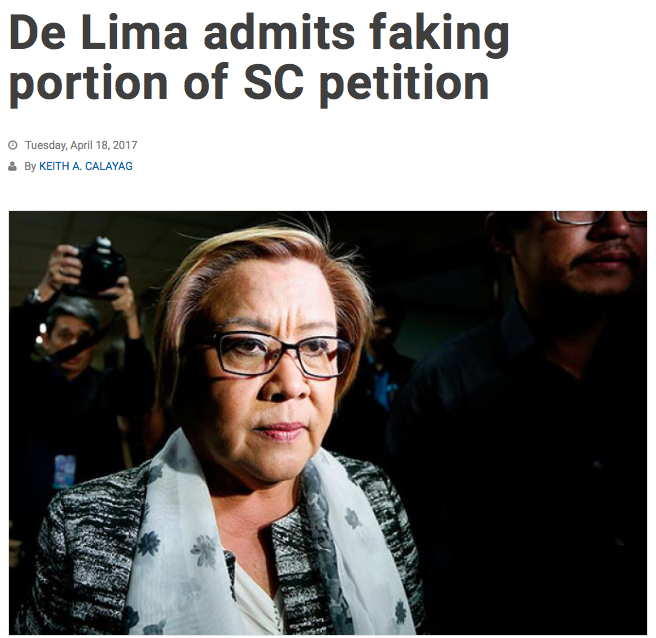 De Lima did not sign her petition to the Supreme Court in front of a notary as the law requires. But the notary knew she was signing it and took steps to verify that she did sign it without actually witnessing the signing. So everything is ok right? I mean it's just a technicality right? Wrong. It's the law. And now De Lima has admitted to violating it. This after insisting everything was above board. "Senator De Lima said today that the Office of the Solicitor General's statement on the alleged defect on the notarization of her petition to the Supreme Court is a false allegation. It has no factual basis. The notary public met with her in Camp Crame; the notary public was in Camp Crame when she was brought there," Hilbay told the high court, reading portions of a statement De Lima made. This is the second time she has been caught lying. When confronted with allegations she was having an affair with her driver she denied it. Until the video came out and then she chalked it up to her "frailties as a woman." Despite the fraud she is still insisting that her petition is genuine and valid and that she is not seeking any special treatment. De Lima in her memorandum stressed that no one questioned the authenticity of the signature in the petition. Her petition, she insists, was "genuine" and "valid." In her memorandum, the senator said that she was not seeking special treatment from the SC when she decided to seek relief directly with the high court. "She seeks only the fundamental right of every citizen to invoke the Constitution as shield and sword against government abuse," the memorandum read. The senator, however, claimed that her petition is special, not because she is a senator but because of the "government's willingness to use its power to pin her down, as fulfillment to the promise made by President Rodrigo Duterte. What a feat of double speak. In a single breath she admits she is lying yet insists her petition is genuine and then she denies seeking special treatment but declares her case is special. And who cares is no one questioned the authenticity? She knew it was inauthentic and submitted it anyway. 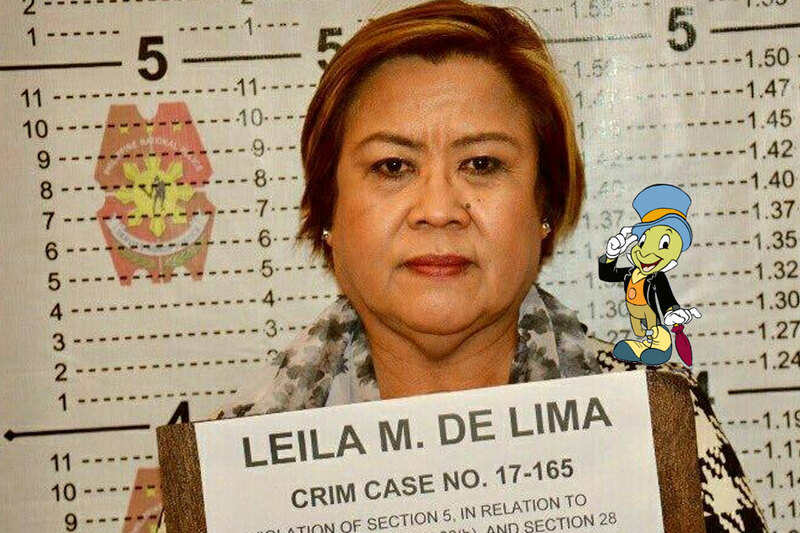 Is Leila De Lima so corrupt that she must have an external conscience to guide her? Does she need Jiminy Cricket to lead her down the right path?? Her case is not special. She is charged with running drugs out of Bilibid Prison. She is charged with corruption which is about as ordinary a charge as a politician can get in the Philippines. Her whole reason to have her case dismissed in the first place was because of a technicality. De Lima went to the SC after Guerrero ordered her arrest, despite a pending motion to dismiss her case on the basis that the Muntinlupa court lacked jurisdiction. At no time has De Lima ever confronted the actual charges against her. Instead she has baselessly alleged that every witness who testified against her in the Senate last year was lying under duress. When confronted with an arrest warrant she attacked the court for not having the proper jurisdiction. Her mode of defence has been to ignore the charges and focus on technicalities. That makes her charge against Solicitor General Jose Calida all the much more ironic. "Desperate." This is how Senator Leila de Lima described the move of the Solicitor General seeking the dismissal of the senator's petition to nullify her arrest. 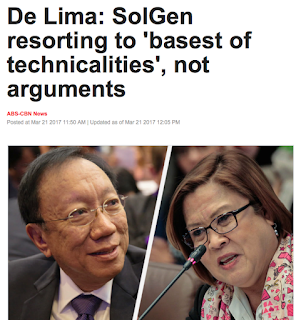 Solicitor General Jose Calida told the Supreme Court in a manifestation that De Lima supposedly falsified the notarization of her pleading. "The senator said that the OSG attack is obviously borne out of desperation," it added. 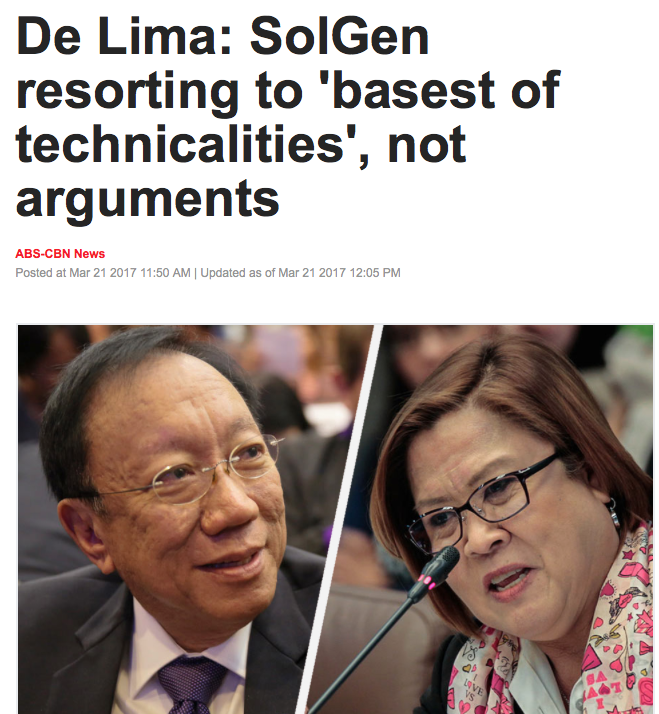 In the same press release, De Lima maintained that Calida's allegation "has no factual basis." And not just ironic but an outright lie. Turns out De Lima was the desperate one seeking to keep her lie from being discovered. Well now the tables have turned, her lie has been admitted, and if she wants to play the technicality card then the Supreme Court should toss her petition because she did not sign it in front of a notary as the law requires. What will the international community she appeals to have to say about this revelation? Will the Inter-Parlimentary Union take this into account when they visit the Philippines for their investigation in the the matter? De Lima lied about her affair and she lied about her petition even going so far as to impugn the Solicitor General. What else has she lied about? How soon until she confesses her guilt in running drugs out of Bilibid Prison? If she does admit her guilt it will be a non-confession chalked up to her "frailties as a woman" or some other such nonsense.